Integration of Flight VS08’s “upper composite” is shown in these photos from the Spaceport’s ZLS launch complex at French Guiana, beginning with its delivery by a special transporter to the mobile gantry that protects Arianespace’s Soyuz (at left). This composite – composed of O3b Networks’ four spacecraft, the Fregat upper stage, plus the protective payload fairing – was then hoisted inside the gantry (center photo), and installed atop the workhorse medium-lift vehicle in the gantry’s upper level to complete its build-up (at right). 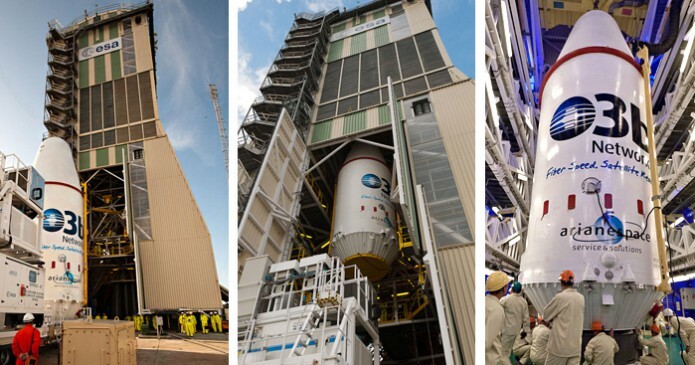 Arianespace’s next medium-lift Soyuz to be launched from French Guiana is now complete following the integration of its “upper composite,” made up of four O3b Networks connectivity satellites, their protective payload fairing and the Fregat upper stage. This activity was performed at the Spaceport’s ZLS launch complex near the town of Sinnamary. It began with the upper composite’s transfer from the S3B payload preparation facility on a special transporter, and was followed by hoisting to the upper level of a purpose-built mobile gantry – which provides a protected environment for the vertical installation. 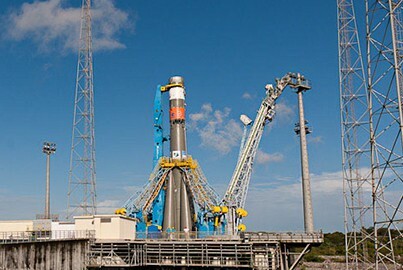 Final checkout of the Soyuz launcher is now underway, leading up to the Arianespace liftoff planned on Thursday, July 10 at precisely 03:55:56 p.m. local time in French Guiana. This mission is designated Flight VS08 in the company’s numbering system, representing the workhorse Soyuz’ eighth flight from French Guiana. The upcoming launch’s payload – four Thales Alenia Space-produced satellites that will join O3b Networks’ pioneering high-speed connectivity system – are to be deployed during a flight lasting 2 hrs., 22 min. Equipped with Ka-band transponders, the satellites will be positioned at a medium-orbit altitude of 8,062 km. Total payload lift performance is estimated at 3,204 kg., including a combined mass of approximately 2,800 kg. for the four spacecraft – which will create a constellation providing telecommunications and Internet services over Asia, Africa, South America, Australia and the Middle East, combining the global reach of satellite coverage with the speed of a fiber-optic network. Flight VS08 will be the second Arianespace mission at the service of O3b Networks, following the orbiting of its initial four satellites with Soyuz in June 2013.